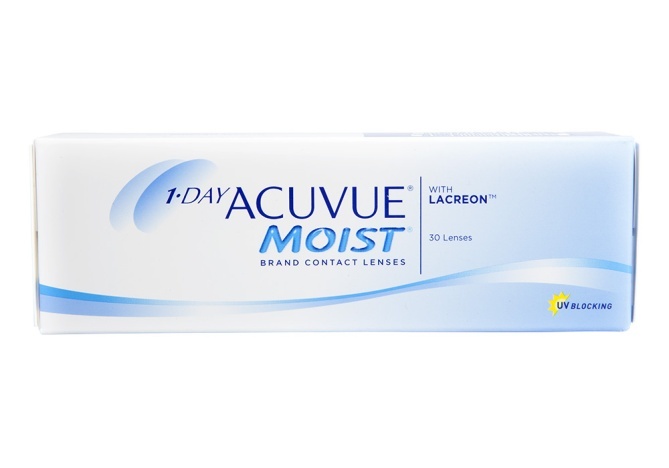 1-Day Acuvue MOIST is a soft daily disposable lens that uses new technology. It uniquely combines the proven 1 Day Acuvue material and adds a moisture-rich ingredient, via a proprietary process to embed it into the lens. This creates a long-lasting smooth cushion throughout the lens, which is great for dry eyes. It helps eyes feel fresh and comfortable all day long. UV Blocking and 123 Inside-out-indicator. "Helps keep eyes feeling moist and fresh even at the end of the day"
New: We have introduced a new daily lens for dry eyes and even more comfort - Crystal Aqua Daily, at a promotional limited offer price of only £5.99 / 30 lenses. A great replacement for 1 Day Acuvue Moist - at 1/3rd of the price, a saving of £288/year! I have been using Acuvue ordinary lenses for a long time but was given Acuvue Moist lenses as a free 'upgrade'. I am not impressed. The lenses are far too flimsy and just not rigid enough to put comfortably into the eye (they have no shape to them) and they stick to the eye ball during wear. I don't know how many pairs I wasted having to put in a new pair during the day, usually by lunchtime because I could hardly see through the ones I put in in the morning! As it seems to be difficult/impossible to get ordinary Acuvue dailies from now on I'm switching to Focus Dailies. Acuvue Moist no thanks. Switched from Acuvue Oasys as was having some reliability issues and tearing (which this site still has not replied to me about, thanks! ) and these are even worse! Really dry by the end of the day, really scratchy and just overall not as good as a 2 weekly lense and over double the cost! I`ll stick to Focus Dailies thanks! I bought these lenses and really wish I had stuck to what I know - I found these really awkward to use as they seem less rigid than other lenses and were constantly turning in on themselves when trying to put them in. I wasted quite a few as they would pop out of my eye when I closed the lid, you have to be really careful to not trap any air behind them when you apply them or off they pop. I didn`t really find my eyes coped any better wearing these than Focus Dailies - so for the frustration they caused I won`t be buying these again. I reviewed these same lenses a while ago and criticized how bad they were, but after being forced to switch from monthly to daily lenses, I originally switched to a different type of Acuvue lenses (i.e. not the Moist but the Advance). When these was discontinued I again was forced to retry this lense as it was the only alternative, but I am happy to say I have been wearing these for over a year and they are much much better than they used to be.